Note: A 57-minute version of this film is also available. Save by buying both together here. "Beautifully shot...[A] moving celebration of the pioneering naturalist's legacy." "Highly recommended...In a world still strongly divided between those aiming toward land subjugation and those insisting on conservation and restoration, his land ethic establishes a strong philosophical basis for environmentalism." 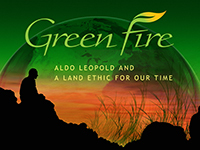 "Excellent...In natural and social science classes, the Green Fire DVD can serve as an excellent resource for considering the complex nature of ecosystems and the development of sustainable practices. In social studies classes and in community use, it will be a fine resource for considering the importance and development of informed environmental protection and policy." "Exquisite documentary...Teachers across the curriculum can use this film. It's inspirational." "By looking into the life of this man who was a hunter, forester, scientist, writer, and philosopher, who found value in both wilderness and human-formed spaces, whose wife came from a long line of ranchers, and who emphasized the benefits of holistic ecosystem management for the good of society, we can begin to see how we might utilize Leopold's land ethic for the betterment of ourselves and our planet." "This film is a historical biography, but it sits comfortably within the space of a social action film...I would recommend this film for introductory college courses in environmental sciences, as well as high school science and biology courses."